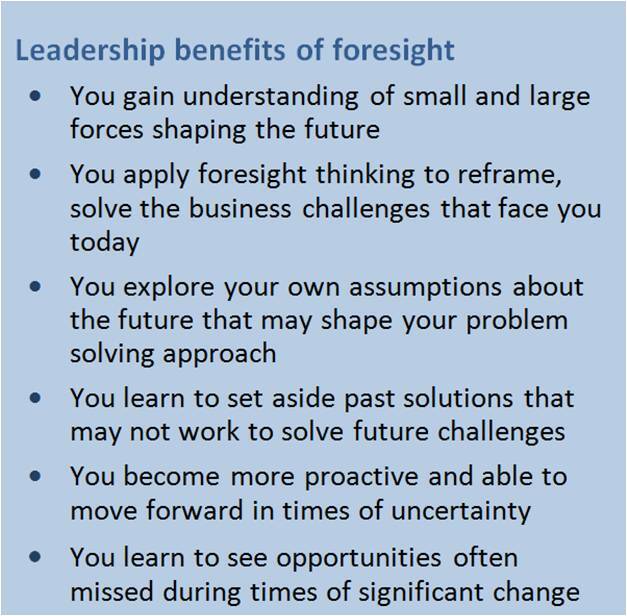 We design and lead foresight training programs for leaders and organizations. Using practical foresight tools, attendees deepen their capacity to be flexible, agile thinkers. Participants discover and expand their exploratory skills to recognize patterns of overt and hidden change. They come away with insights that lead to fresh perspectives and novel solutions. Each participant leaves the course with a customized action plan that translates insight into strategy. Contact us at 202-270-0903 or jjarratt@leadingfuturists.biz to find out more. C-Suite leaders, managers, key stakeholders, board members, emerging leaders, and anyone involved with understanding and developing strategy. Contact us to plan your customized foresight training. We are a consultancy that focuses on strengthening the foresight organizations bring to leadership and strategy. Some of our recent foresight workshops and programs include: “Maine 2050” for the state Bureau of Human Resources. Aging workforce workshops for the U.S. Chamber of Commerce. Workforce scenarios for Disney. Futures exploration for the American Nurses Association. We have extensive experience in researching and analyzing changes in work, worklife, technology, as well as values and attitudes in the workforce. Since the 1980s, we have designed and led workshops for emerging leaders at Principal Financial Group, Lend Lease Group (e.g. Bovis Lend Lease), Fannie Mae, Honeywell, Microsoft China, and others. Jarratt and Mahaffie co-authored FutureWork, an exploration of the broad forces of change shaping work. Katherine Green is an expert in organizational development and leadership. We put our skills together to fine tune designs for rich, valuable, and insightful workshops that help organizations face the future, prepared. 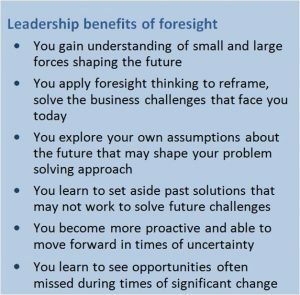 To download this pages as a pdf, click here: Strategic Foresight TRAINING.